Joanne is a graduate of the Ford Business School in Pottsville, Pennsylvania. She is the Vice-President and Treasurer of Tilghman’s Automotive Parts in Jobstown, New Jersey. 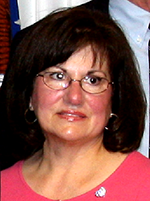 Joanne is a past Vice-President and an active member of the Wrightstown Area Rotary Club. She is currently Director of Vocational Services for the Wrightstown Area Rotary. She is an award recipient of the Rotarian of the Year for Wrightstown and the Springfield Municipal Alliance Volunteer of the Year Award. Joanne is an active member and past Treasurer for The Major Thomas B. McGuire Memorial Foundation, Joint Base McGuire-Dix-Lakehurst.